BUENOS AIRES -- Ah, the memories: Feasting on slabs of tender Argentine steak. Skiing at a resort overlooking a shimmering lake in the Andes. And late-night outings to a "gentlemen's club" in a posh Buenos Aires neighborhood. Such diversions awaited the investment bankers, brokers and money managers who flocked to Argentina in the late 1990s. In those days, Wall Street firms touted Argentina as one of the world's hottest economies as they raked in fat fees for marketing the country's stocks and bonds. Thus were sown the seeds of one of the most spectacular economic collapses in modern history, a debacle in which Wall Street played a major role. The fantasyland that Argentina represented for foreign financiers came to a catastrophic end early last year, when the government defaulted on most of its $141 billion debt and devalued the nation's currency. A wrenching recession left well over a fifth of the labor force jobless and threw millions into poverty. An extensive review of the conduct of financial market players in Argentina reveals Wall Street's complicity in those events. Investment bankers, analysts and bond traders served their own interests when they pumped up euphoria about the country's prospects, with disastrous results. Big securities firms reaped nearly $1 billion in fees from underwriting Argentine government bonds during the decade 1991-2001, and those firms' analysts were generally the ones producing the most bullish and influential reports on the country. Similar conflicts of interest involving analysts' research have come to light in other flameouts of the "bubble" era, such as Enron Corp. and WorldCom Inc. In Argentina's case, though, the injured party was not a group of stockholders or 401(k) owners, it was South America's second-largest country. Other factors besides optimistic analyses impelled foreigners to pour funds into Argentina with such reckless abandon as to make the eventual crash more likely and more devastating. One was Wall Street's system for rating the performance of mutual fund and pension fund managers, who were major buyers of Argentine bonds. Bizarrely, the system rewarded investing in emerging markets with the biggest debts -- and Argentina was often No. 1 on that list during the 1990s. Within the financial fraternity, some acknowledge that this behavior was a major contributor to the downfall of a country that prided itself on following free-market tenets. That is because the optimism emanating from Wall Street, combined with the heavy inflow of money, made the Argentine government comfortable issuing more and more bonds, driving its debt to levels that would ultimately prove ruinous. "The time has come to do our mea culpa," Hans-Joerg Rudloff, chairman of the executive committee at Barclays Capital, said at a conference of bank and brokerage executives in London a few months ago. "Argentina obviously stands as much as Enron" in showing that "things have been done and said by our industry which were realized at the time to be wrong, to be self-serving." Compounding the financial industry's sins, Rudloff said, were its sales of Argentine bonds to individual investors, mostly in Europe, when the pros balked at buying them. Moreover, in mid-2001, as Argentina was hurtling toward default, Wall Street promoted an expensive and ultimately futile "debt swap" that gave Argentina more time to pay its debts but jacked up the interest cost. The fees on that deal alone totaled nearly $100 million. Wall Street firms assert that their enthusiasm for backing Argentina's borrowing was motivated by a sincere, if misplaced, optimism about the country's economic strengths. But critics contend that the same forces that fueled the U.S. tech-stock frenzy were at work in Argentina, in effect causing economic globalization to play a cruel trick on the country. Charles W. Calomiris, a Columbia University economist who was one of the earliest prophets of Argentina's financial doom, wonders why government investigators have not intervened, given the danger that the same fate could befall other countries. "How come we have one standard for private-sector deals, where everybody is getting all upset about conflicts of interest, and nobody in Washington has raised an eyebrow over the obvious conflicts of interest involving research and underwriting activities by U.S. financial firms in the area of emerging-market sovereign debt?" Calomiris said. "A Bravo New World." So proclaimed the title page of a report on Argentina and other Latin American markets that Goldman, Sachs & Co. sent to clients in 1996. The report hailed Argentina for shucking policies that had afflicted the country for decades with stagnation, bouts of hyperinflation and repeated currency devaluations. The government of President Carlos Menem was accelerating reforms launched in the early 1990s aimed at deregulating the economy and turning inefficient state-run enterprises over to the private sector. Particularly important, the report's authors observed, was Argentina's determination to maintain its currency "convertibility" system, which guaranteed that the central bank would exchange pesos for dollars at a fixed rate -- one peso for one dollar. Implemented in 1991, that system was remarkably effective in keeping inflation at bay, imparting a sense of stability among consumers, savers and businesses that had been absent for generations. "For Argentine citizens and for those investors who were willing to believe in [the government's] promises, the benefits are now becoming apparent," the Goldman report said. The nation's economy, which started to grow robustly in the early 1990s, expanded at an average 5.8 percent rate from 1996 through 1998. As the report suggested, that success story translated into a compelling sales pitch for the Street. Seeking to exploit a fevered atmosphere for emerging markets, firms such as Goldman, Morgan Stanley & Co. and Credit Suisse First Boston LLC built their presence in Argentina and neighboring countries by dispatching teams of economists and financial experts, many in their twenties and early thirties. They competed fiercely for "mandates" from governments to be lead managers of bond sales, especially in Argentina, whose government was the single largest emerging-market bond issuer. They found plenty of customers for the bonds in the United States and other wealthy countries among professional investors who managed hundreds of billions of dollars held in mutual funds, pension funds, insurance companies and other large institutions. "Every time we finished a meeting [with institutional investors], the orders would come," said Miguel Kiguel, who then was Argentina's finance secretary, recalling the demand for a $2 billion issue of 20-year bonds, managed in 1997 by J.P. Morgan and Merrill Lynch. In the emerging-markets world, people "were making money hand over fist in those days," said Stewart Hobart, a recruiter working in the field. According to Hobart and other recruiters, strategists and senior economists at major banks typically earned $350,000 to $900,000 a year, including bonuses, while their bosses, the heads of emerging-markets research, were paid well more than $1 million. Much was at stake for the firms in their Argentine business. Were it not for Argentina's prodigious bond sales, LatinFinance magazine reported in 1998, many emerging-market investment bankers "would probably have been twiddling their thumbs" that year, because crises in Asia and Russia caused capital flows to dry up to the markets they usually served. One securities firm, Dresdner Kleinwort Benson, reassured clients who were worried that Argentina would follow countries like Thailand and Indonesia into turmoil. "Argentina has come through the first phase of the Asian crisis with flying colors," the firm said in a June 1998 report, and it was "no coincidence. The economic fundamentals are considerably stronger than three and a half years ago." Amid the ebullience, however, Argentina was laying the groundwork for its economic destruction. In meetings with top Argentine policymakers in April 1998 to discuss the country's finances, a senior official of the International Monetary Fund, Teresa Ter-Minassian, sounded the alarm that the country might be headed for an Asian-style meltdown. "The Argentine economy contains a sort of Molotov cocktail," Ter-Minassian was quoted in Argentine media reports as saying. Many economists' postmortems on the crisis agree: that was when Argentina went wrong, missing a crucial opportunity while the economy was going gangbusters to reduce its vulnerability to crisis. In particular, the government had to shrink its budget deficit, because its constant borrowing was causing its debt load to increase, from 29 percent of gross domestic product in 1993 to 41 percent of GDP in 1998. Argentina had a special reason to exercise extraordinary prudence: the cherished convertibility system for the peso. If markets began to get jittery about the government's ability to repay its debts, they might well lose confidence in the currency, and overwhelm the system by dumping pesos for dollars. Argentina's budget policy was "not all that bad" during the 1990s; "it just wasn't terrific at a time when terrific was needed," said Nancy Birdsall, president of the Center for Global Development. Globalization is supposed to keep problems like Argentina's from occurring. In theory, international financial markets reward sound economic policies by steering capital to countries that practice them. The influence of the capital inflow makes a government even more disciplined, because policymakers know that otherwise investors may yank their money out. In practice, the gusher of foreign money lulled Argentina's government into complacency, acknowledged Rogelio Frigerio, who was secretary of economic policy in 1998. "If you get the money so easily as we did, it's very tough to tell the politicians, 'Don't spend more, be more prudent,' because the money was there, and they knew it," he said. Argentina's best chance to put its economy on a sound footing was gone soon thereafter, as supercharged growth gave way to recession in 1999, mostly because of a financial crisis in neighboring Brazil. At that point, a vicious circle emerged: The slump caused tax revenue to fall, which widened the budget deficit, which aroused concern about the government's ability to service its debt, which caused markets to drop, which deepened the recession, and so on. Argentina was unable to escape the vicious circle, which gradually intensified over three years. At the big Wall Street firms, few realized how dire the country's predicament was -- with one notable exception. Long before Argentina's default, Desmond Lachman, chief emerging market economic strategist at Salomon Smith Barney Inc., saw that the Argentine economy had no way to break out of its slump and would hit the wall one way or another. Many people in the emerging-markets business recall the gloom Lachman conveyed in conversations with clients as recession began to grip Argentina, while analysts at other firms predicted a recovery. But Lachman's pessimism was not spelled out in reports published by Salomon, a part of Citigroup, which was a major underwriter of Argentine government bonds. Written research reports are important in influencing where capital flows, partly because money managers want to have material in their files to back up their investment decisions. Officials in Argentina's economy ministry knew that Lachman was describing the country's prospects in very dark terms. They continued to include Salomon among their underwriters anyway, but they told the firm to "make sure you have a variety of views" besides Lachman's, a former Argentine official recalled. Published research on Argentina by other Salomon analysts tended to be relatively sanguine about the country's chances for pulling through, even in the turbulent months of 2001 leading to the default. Lachman, who left Salomon to become a scholar at the American Enterprise Institute, declined to be quoted for this story. Asked why his negative assessment of Argentina wasn't published, Arda Nazerian, a spokeswoman for Citigroup's securities arm, cited Salomon's merger with Citibank in the fall of 1998, which created a firm with an abundance of analysts, enabling Lachman to spend more time privately with big clients. "The expansion of our emerging-markets research team reduced Desmond's responsibilities for writing on individual countries," she said. Lachman's story is emblematic of Wall Street's reluctance to offend major issuers of securities. "It's a lot of self-censorship," said Federico Thomsen, who until recently was chief economist of ING Barings's office in Buenos Aires. "It's like, if you have something good to say, you say it, but if you have something bad to say, just keep your mouth shut." The reports that Wall Street firms published on Argentina, to be sure, became much less bullish as the recession deepened in 2000 and early 2001. Analysts increasingly stressed the importance of the government cutting its deficit and reforming labor laws. But in general, the reports predicted that Argentina would muddle through. An example was a report published in October 2000 by J.P. Morgan, the biggest underwriter of Argentine bonds in the 1990s, titled, "Argentina's debt dynamics: Much ado about not so much." By contrast, the analyst who most publicly warned of Argentina's impending doom was Walter Molano, head of research at BCP Securities, a Connecticut firm that does no underwriting of sovereign bonds. Such evidence of bias among analysts is misleading, according to some current and former analysts who maintain that their overriding objective has always been to serve investor-clients well by providing the best advice possible. "My incentive is to be able to predict what will happen," said Siobhan Manning, emerging market strategist at Caboto USA. "If I can predict accurately, hopefully I gain credibility, and the firm does, and I'm able to make money." But others acknowledge that they cannot help being influenced by the fact that their compensation is likely to be greater if their investment banking colleagues win deals to sell bonds. For one thing, success for the investment bankers means the pool of money available for bonuses will be larger, and at some firms, the analysts' bonuses are decided by groups of managers that include investment bankers. "Your salary will be about one-third of your compensation in a decent year, so your bonus is everything," said Christian Stracke, who covered Latin American economies at Deutsche Bank and other firms in the 1990s and is now with CreditSights, a much smaller outfit specializing in research. "You'll never know what percentage of that bonus came from the recommendation of [investment bankers], but you do know that without the recommendation of [investment bankers], your bonus is just not going to be very big." Although analysts want to make the right calls, Stracke said, "they're in it for the money. If they were in it to be smart, they'd be professors." It wasn't just rosy analyst reports that enticed big investors to buy Argentine bonds. Many money managers thought they had to be big holders of the bonds because their jobs depended on it. The word "perverse" is repeatedly used by people in the industry to describe what happened. Just as in the world of stock market investing, where money managers aim to beat the Standard & Poor's 500-stock index, many professional investors in emerging markets are judged every quarter or so by how well their portfolios fare in comparison to a benchmark. Their job security and annual bonuses have often depended on whether they outperform an index called the Emerging Markets Bond Index-Plus, developed by J.P. Morgan, which tracks the prices of bonds issued by various emerging economies. During much of the 1990s, Argentina had the heaviest weighting in the index of any nation, peaking at 28.8 percent in 1998 -- not because of its economic size, but simply because its government sold so many bonds. The index virtually forced big investors to lend vast sums to Argentina even if they feared that the country was likely to default in the long run, several money managers said. Although default would hurt their portfolios, they would still lose less than the index as long as they were a bit "underweight," meaning they held a smaller percentage of Argentine bonds than the index dictated. They didn't dare be too far underweight. Money managers who shunned Argentine bonds were taking a huge risk, because their portfolios would almost certainly underperform the index in the event Argentine bonds rallied, as happened from time to time. So at investor gatherings, money managers who were asked their views and investment positions on Argentina would often say "negative" and "underweight," said Mohamed El-Erian, who manages emerging-market bonds at Pimco, the giant West Coast investment firm. "The dreaded third question would come: 'How much underweight?'" El-Erian said. "They would say, 'It's 22 percent of the index. I can't possibly be more than 5 percent underweight.' So they'd have 17 percent of their money in Argentina." Indexation survives for lack of a good alternative for measuring money managers' skills, but unhappiness over its flaws is widespread. Everyone knows that the system "can cause credit deterioration" by impelling more lending to borrowers with the most debt, said Michael Pettis, a professor at Columbia University Business School who was a managing director in the fixed income capital markets group at Bear Stearns. It is like "a bizarre AA program in which you remove booze from the homes of people who are reducing the amount they drink and put it into the homes of people who are drinking more every day," Pettis said. "This is probably not the best way to reduce drunkenness." Professional portfolio managers, of course, had a pretty good sense of the dicey game they were playing with Argentine bonds. The same could not be said of some others. Felicia Migliorini, a divorcee who lives north of Rome, sank her life savings, about $135,000, into Argentine bonds in March 2001. About 400,000 fellow Italians did the same; together with other individuals, mostly in Europe, they now hold about $24 billion in claims on the bankrupt Argentina government. Migliorini has been forced to put her apartment up for sale because she cannot afford the condominium fees and other expenses. Like thousands of other Italians, she blames her bank, which sold her the bonds. Lawsuits are flying; the banks contend that the purchasers were mostly wealthy, sophisticated people who surely realized what sort of risks they were taking. But Migliorini is outraged. "They told me [the bonds] were good, stable, guaranteed, and that since they were obligations they had to be paid back," she said. European retail investors like Migliorini were an attractive market for the syndicates selling Argentine bonds. Professional money managers in the United States were often reluctant to buy at the yields the Argentine authorities were willing to pay. So the syndicates tailored a number of their offerings to Europe, in local currencies. One attraction of the European market was that regulations protecting small investors are substantially less strict than in the United States. "That's what kept Argentina going," said Tom White, who at the time was employed by Metropolitan Life Insurance Co. as an emerging-market bond manager. "Those poor suckers didn't have a clue as to what they were buying." For Argentina, "keeping the country going" might sound beneficial. But a different conclusion could be reached as the recession dragged on and the government's debt neared 50 percent of gross domestic product in late 2000. The longer Argentina was kept going with infusions of cash, and the more the country delayed facing unpleasant realities about its plight, the more cataclysmic a crash it would suffer. At a closed-door meeting at the Argentine Embassy in Washington in October 2000 to discuss the country's finances, Calomiris, the Columbia professor, urged that the government summarily reduce the amount of its debt payments by 20 to 30 percent. The country, he recalled saying, was ensnared in a trap: The markets were demanding increasingly high interest payments on the mountain of debt at rates far in excess of the economy's capacity to grow. Foreign creditors were bound to conclude sooner or later that the debt was unpayable in full, Calomiris warned, and if Argentina continued trying to honor its obligations it would only build up more vulnerability to complete financial breakdown. 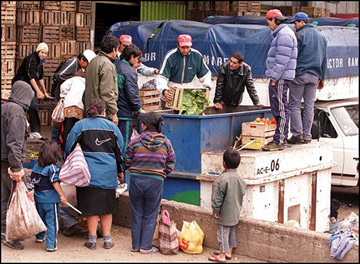 Calomiris's proposal was rejected by the Argentine government and the IMF as too drastic. But in the months that followed, his scenario began to unfold more or less as forecast. Capital fled the country and interest rates skyrocketed when a political rift erupted in the cabinet of President Fernando de la Rua in November 2000. The IMF rushed to Argentina's aid with a $14 billion loan, but after a brief rally, the country's markets sank anew. By the spring, buyers of Argentine government bonds were demanding yields as high as 10.5 percentage points above U.S. Treasurys, which meant that interest costs would become even more burdensome for the government and the economy at large. Wall Street had one more plan to keep Argentina going -- a profitable one, at least from the Street's standpoint. Upon being appointed Argentina's economy minister in March 2001, Domingo Cavallo had barely ensconced himself in his office before David Mulford, chairman international of Credit Suisse First Boston, arrived to make a pitch. Cavallo, the father of Argentina's peso-convertibility system, had a long history of dealings with Mulford, going back to Cavallo's previous term as economy minister from 1991 to 1996. The men got to know each other when Mulford was Treasury undersecretary for international affairs during the first Bush administration, and their relationship deepened when Mulford joined CSFB, which handled the privatization of Argentina's state oil company and became one of the biggest underwriters of Argentine government bonds. Mulford had an idea for a deal that would dwarf the ones he had done before. He proposed a "debt swap," in which Argentina's bondholders would be given the opportunity to exchange their old bonds for new ones, on a voluntary basis. The purpose was to eliminate a problem that was disturbing the markets -- the large amount of interest and principal payments Argentina was scheduled to make in the years 2001 through 2005. Under the swap, those interest and principal payments would be stretched out so that much more would fall due in the years after 2005. That would give Argentina "breathing space" to restart economic growth, Mulford contended. Despite the skepticism of some analysts and policymakers, including the IMF's chief economist, who believed the deal would prolong the agony and dig Argentina into a deeper hole, Cavallo agreed to try the swap. Mulford traveled to the world's financial capitals to pitch the swap, which he described as creating the opportunity for improvement in the economy, the fiscal situation and market sentiment. The deal was "essential to long-term success in restoring Argentine growth," he declared in Buenos Aires. Mulford declined to comment for this article. The results, announced in June, were proclaimed a resounding success: Bondholders offered to exchange nearly $30 billion worth of bonds, considerably more than had been expected. The seven banks that managed the deal, led by CSFB and Morgan, collected nearly $100 million in fees, an amount they justified by pointing to the 60-plus experts who worked on the complex transactions. Within weeks of the deal's completion, though, Argentine markets were again in a tailspin and another IMF loan in August provided only a temporary respite. By late November 2001, deposits were flying out of Argentine banks. The government took the extraordinary measure of slapping controls on withdrawals. That helped trigger street demonstrations and rioting, which led to the resignations of Cavallo and de la Rua in mid-December. Their successors soon thereafter declared default and freed the peso from its dollar anchor. A year and a half after the crash, Argentina has begun recovering from its depression. Although the economy is still producing considerably less than before the crisis, and unemployment is much higher, growth has picked up in the past several quarters. A few Wall Street bankers are sniffing around again for deals to restructure defaulted debt, but the national government has ruled out hiring any firm that underwrote its bonds during the 1990s. The brightening outlook in Argentina has helped attract a new inflow of funds from abroad, enough to drive the stock market and the peso sharply higher this year. This time, however, the government has responded with restrictions aimed at limiting the amount of "hot" money coming into the country. The move reflects the view of some in Argentina, notably Roberto Lavagna, the current economy minister, about the lessons that should be learned from the country's economic collapse. "The lesson is, we must pay attention to bubbles," Lavagna said in a visit to Washington this year. "With stocks, or companies, or countries, all are part of the same phenomenon. Probably Argentina is the best example of a country." For developing nations, "the worst period is when financial markets have the most liquidity," Lavagna said. "This is when countries make the worst mistakes. That is certainly the case in Argentina." Special correspondents Brian Byrnes in Buenos Aires, and Sarah Delaney in Rome, contributed to this report.